Toasted Crumpet with Butter . . . Nothing Tastes Better Than This! Eating a Freshly Homemade Crumpet is a Truly Magical Experience! In every supermarket across the United States, English Muffins take up a large section of the bread aisles. However, the toasted tea cake known more popularly in England is actually the crumpet, and you will be hard pressed to find them in average American grocery stores, although they can be found in Trader Joe's and The Fresh Market, among other boutique shops. A crumpet is a yeast-leavened thick pancake that is punctuated with lots of air bubbles. It is cooked on a greased griddle in a metal ring. 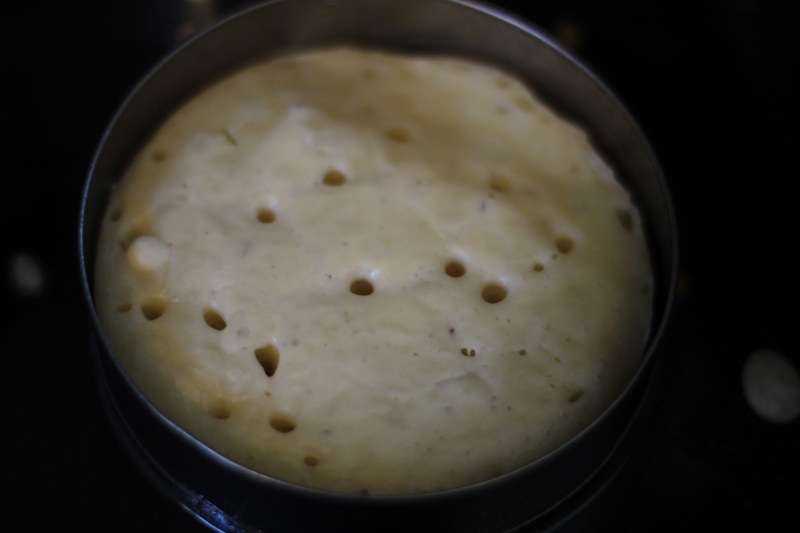 A good crumpet will have lots of those little air bubbles punctuating the cooked surface. After the crumpet is cooked on a griddle it needs to be toasted whole (do not split in two as you would for an English Muffin). 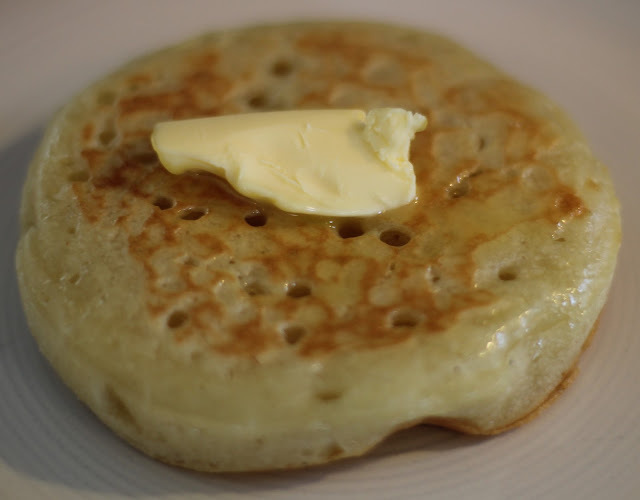 Then, spread the top with butter which melts into all of the little pores giving the crumpet a rich and delicious taste. English muffins are made in a similar fashion but with a much thicker batter and are meant to be torn open into two halves first before toasting. Going back to the 14th century, there is a reference to a "crompid" cake and there are 17th century references to buckwheat griddle cakes called 'crumpits". The Welsh also have a pancake called a "crempog" and the Bretons have the 'krampoch", a buckwheat pancake. 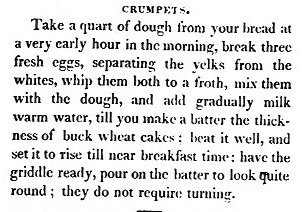 Here is another American version of the crumpet by Rufus Estes in his 1911 work, Good Things To Eat, As Suggested By Rufus; A Collection Of Practical Recipes For Preparing Meats, Game, Fowl, Fish, Puddings, Pastries, Etc. Rufus Estes was born a slave in Tennessee in 1857. After the civil war was over, while still quite young, he worked at various jobs to help support his family. He milked cows, carried dinners out to laborers in the fields, was employed in a restaurant, and then, in 1883, he began work as a private car attendant for the Pullman Company. He was assigned the task of taking care for special parties which brought him into contact with many prominent people such as Presidents Cleveland and Harrison. In addition, Estes also worked for private individuals serving them in their own personal train cars. As result of this job and from his experience as a chef, Rufus learned a lot about good food and his cookbook is a testament to his experiences. 1. Scald the milk and then take off the heat. Add the butter and let it melt into the milk. Whisk in the salt. Pour into a large mixing bowl and set aside to allow it to cool. 2. While waiting for the milk to cool, dissolve the yeast in the 1/2 cup of warm water. Set aside until it becomes bubbly, about 5-10 minutes. 3. After the milk cools to lukewarm, add the dissolved yeast and the flour to it. Stir until well-mixed, cover and set aside in a warm place and let rise at least 1 hour. 4. Heat an electric skillet to 325º F. Grease the skillet with oil or spray oil. Grease crumpets rings (measuring 9.5 cm in diameter). 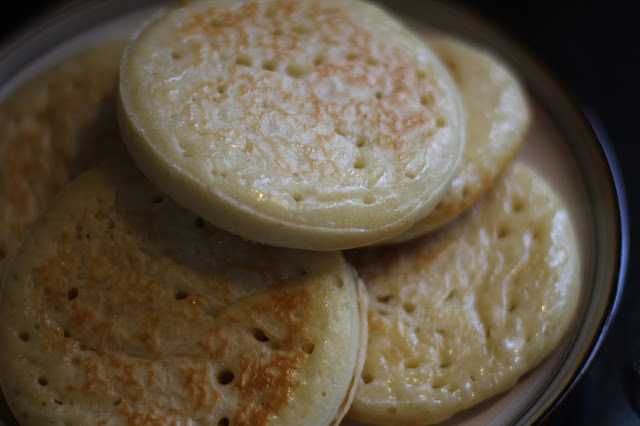 Arrange crumpet rings on the surface of the skillet. 5. Spoon 1/4 cup of the batter into each ring. 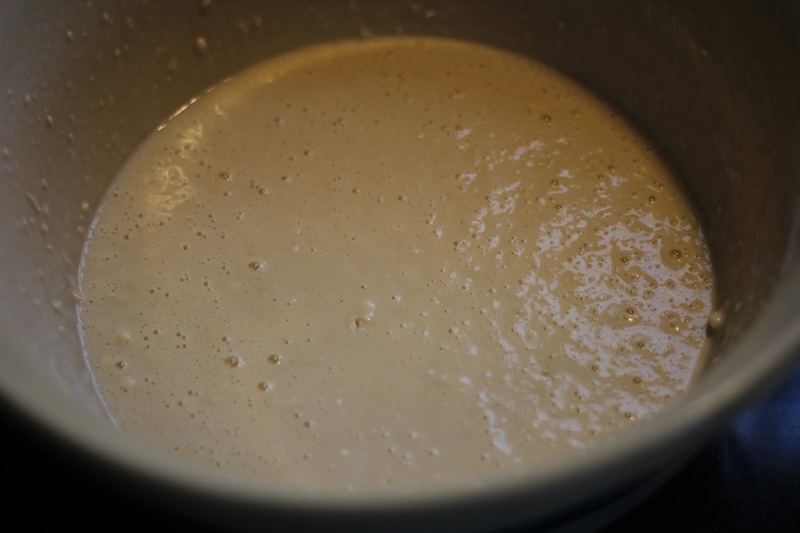 Allow the crumpets to cook for about 7 minutes, until they begin to develop holes on their surfaces and firm up. 6. 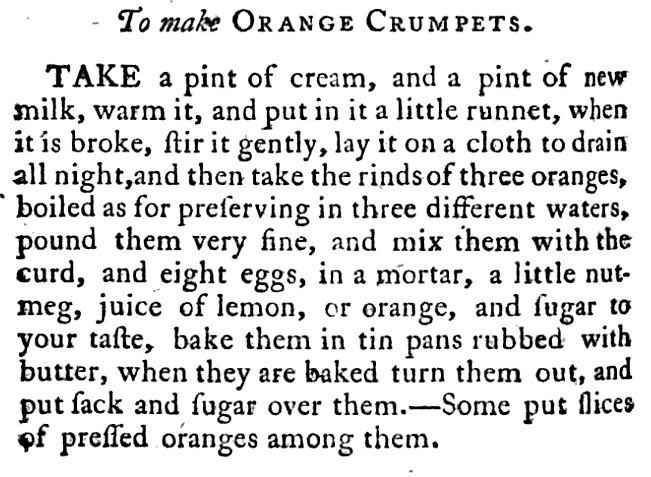 After the crumpets are sufficiently cooked (see picture below), remove the rings and flip. 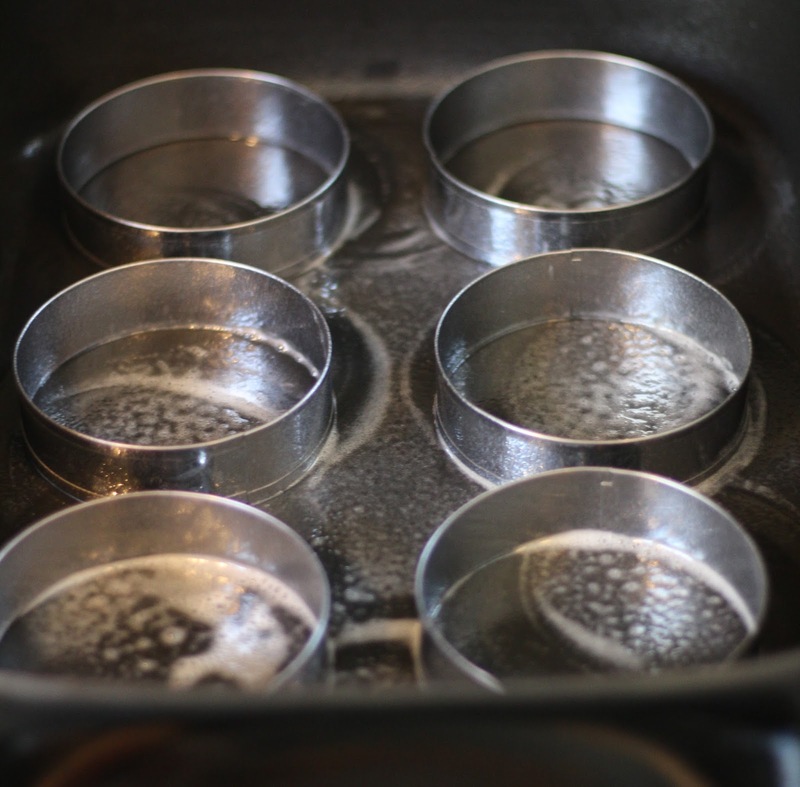 Cook for just 1 minute on the other side to make sure the batter on the tops is cooked thoroughly. Holes will form on the tops of the crumpets as they cook. 7. Repeat steps 4-6 until all of the batter is gone. Crumpets Straight Off the Griddle! Stack the crumpets between layers of parchment paper. Top with butter, jam, lemon curd, or anything else you like!